It´s been dark outside, there were two flickering candles lit on the advent wreath and the radio played silently Christmas jazz. We were peacefully drawing snowmen at the table and talking about the Christmas time, the Advent, Saint Nicolas, baby Jesus and the festive day again. Also about the fact that not everybody believes in baby Jesus because he believes in Santa Clause instead. And then we talked about those who don´t celebrate Christmas at all because they celebrate Hanukkah. It seemed that the children accepted the question of different faith fairly as a natural thing and the oncoming festive days were looked forward to and awaited in a common jolly expectation. Despite all that being said their faith in baby Jesus was unshakeable. We shared our thoughts on what does baby Jesus look like and planned our trip to the Prague baby Jesus. 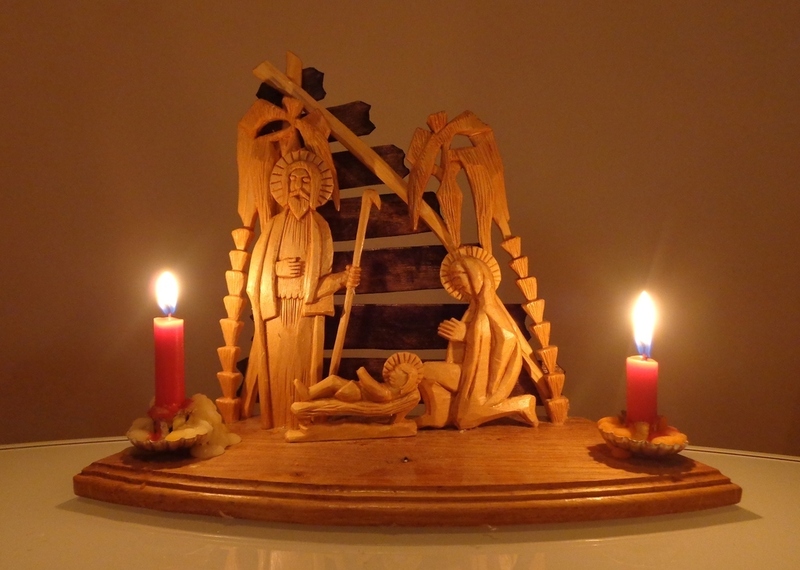 We were all looking forward to putting our own baby Jesus – an innocent baby carved out of the lime tree that decorates our Christmas tree, at its very top. From the following conversation we had we gathered that her fascination by Virgin Mary lied in her role as the woman who gave the gift of life to baby Jesus and who then lovingly cherished him. We realized that Virgin Mary became more important to Elli than the baby Jesus himself this year and also that she cares deeply for the wholiness of the family that Mary, Joseph and the baby Jesus represent. The letter Elli wrote addressed Virgin Mary more than the baby Jesus whom she considered to be more or less just the delivery boy with gifts. It´s about time to remind ourselves of other relevant circumstances of the Christmas festive days and Jesus Christ himself. He should not remain a mere postman for the kids. There are many other sides to the preacher of Nazareth than the delivery of the gifts. Changing water into wine and walk on the surface of water he could, they say. So, wishing you merry fairy Christmas.